When calculating the wealth level for an extraordinary weapon, is the cost of the base weapon added to the cost of the extraordinary attribute/bane/property? For example, would a quarterstaff with Creation 3 have a wealth level of 2 or 3? You obtain the item seperate, then you do the extraordinary work on it. 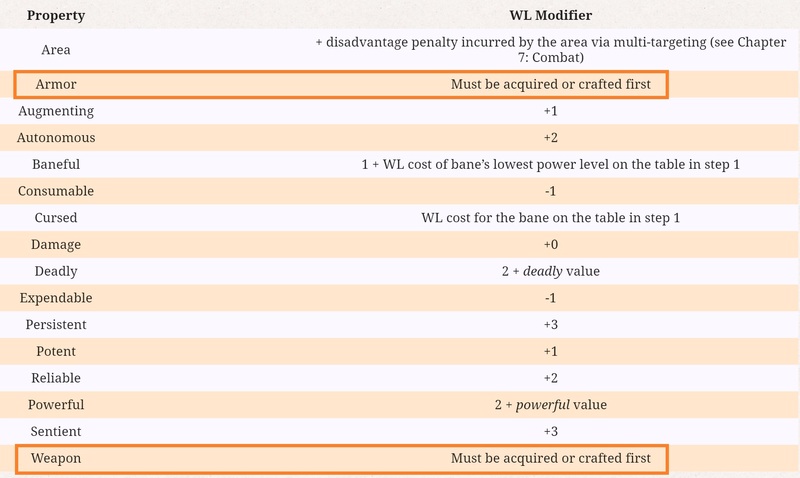 As you can see on the table that tells you the WL Modifier for things, there is no actual modification to the price from crafting, you simply must acquire or craft first. Keyword there actually being “first”. Thanks for pointing that out. I didn’t really process what that meant when I was reading it earlier, but now I see what the intent is; if the base item is lower than your wealth level, it doesn’t make much of a difference, but if it’s equal, you have to wait longer to get the extraordinary stuff added. I built the extraordinary item builder and I made the same assumption as you when it was released; the community set me straight too so don’t worry, common misunderstanding.